As the British public reels at the news that entertainment legend Dame Barbara Windsor has been living with Alzheimer’s for four years, it’s a reminder that dementia is a growing condition that can touch you, your friends and your family. Thanks to medical advances, we have an ageing population living longer and fuller than ever before, but we must also deal with conditions like Alzheimer’s inevitably affecting even more of us: currently, that means 500,000 people in the UK. We know getting an Alzheimer’s diagnosis can be devastating for a patient and their family, as thoughts of the future seem scary and impossible. It feels cruel and upsetting for everyone involved. Yet there are many ways to support someone with Alzheimer’s in their daily life, at any stage of the condition, allowing you to do something practical. When a person with Alzheimer’s starts talking about their diagnosis, well-meaning friends and relatives can sometimes jump in with unhelpful advice or anecdotes about someone else’s experience. This can cloud everyone’s judgement and cause the patient more distress. Your first port of call, aside from medical support from your GP, should be registered charities like the Alzheimer’s Society, which provides a wealth of information. Age UK also has plenty of advice and can give local support, such as drop-in groups for those affected. There is some public confusion about the difference between Alzheimer’s and dementia: Alzheimer’s disease is the most common cause of dementia, whereas dementia is a set of symptoms used to describe over 100 progressive brain syndromes affecting cognitions and emotions. Though there is no cure for Alzheimer’s, some medications can help slow its progression. Though Dame Barbara Windsor was diagnosed in 2014, her husband has spoken of the move from a condition that has good and bad days to a more advanced stage, where ‘a definite continual confusion has set in, so it’s becoming a lot more difficult for us to hide’. As you spend time with someone whose Alzheimer’s progresses, you will notice their lucid moments become less regular, and it is more of a struggle to recognise the person you know and love. It can be tempting to correct them when they forget people, places, events or words, but you should avoid doing this where possible. Instead of correcting them (for example, saying “You can’t go and see your Auntie Flo – she died in 1990,”), just go along with what they say (“Let’s arrange something with Auntie Flo in a few weeks,”). By avoiding further confusion and possible anger or frustration, you will keep your loved one calm. Find more tips from Dr. Marie Marley, author of books on Alzheimer’s. 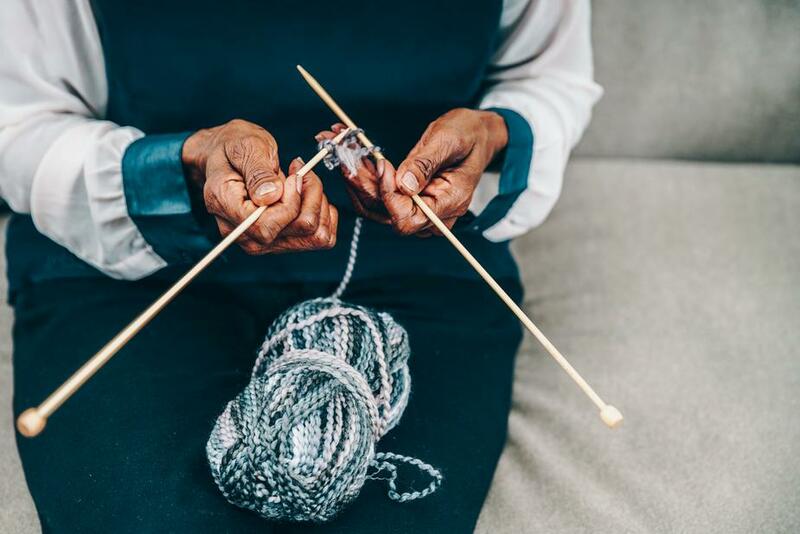 Incorporate space and materials that relate to your Alzheimer’s sufferer’s personal life or their old work life: knitting or crafting materials, perhaps, or sporting memorabilia for someone who used to work in the sports industry. This will make them feel comfortable and give them talking points. You may also need physical adaptations to their home to keep them independent in the early stages of Alzheimer’s. The distant past will be fresh in their memory, but they may also want to help with manageable tasks around the house, such as washing up. Repetitive tasks can aid with building and maintaining a routine. Each day is different: some days they might not be able to do the task, but on other days it will give them a sense of achievement. The patient’s physical needs and abilities will also change; some people with Alzheimer’s refuse food, change their eating habits, or can’t use cutlery. Meals should be prepared and eaten in relaxed environments to reduce stress and distractions, so try to limit noise, cluttered places and patterns. Don’t rush their eating, and don’t worry about messy eating habits: as we’ve mentioned before, keeping calm is key. Knitting is a great activity to calm Alzheimer’s patients and give them a creative outlet. Music therapy is perhaps the most important occupational therapy for people with Alzheimer’s, as it’s hugely beneficial. When many other memories have been lost, songs and melodies from decades earlier will be familiar to the patient, even in late stages. Age UK has plenty of information on the impact of music for dementia. Art therapy can be useful, too, whether painting, drawing or printmaking. In the early stages of Alzheimer’s, a patient may withdraw from activities they used to enjoy, but art is one thing they can resume or take up, regardless of ability. With adult colouring books still popular, it’s never been easier to find art materials on the high street. 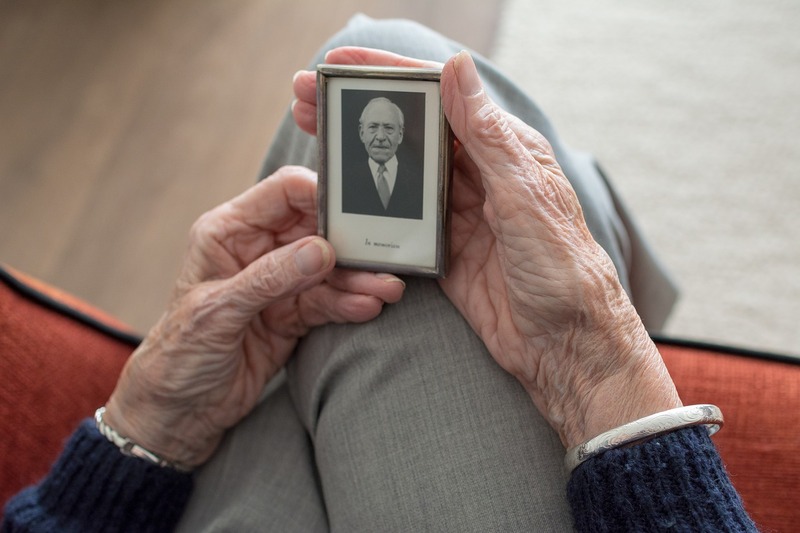 Creating a record of the person’s life, either with professional help or as a self-directed project, can help you reconnect with an Alzheimer’s sufferer and build up a picture of their past. It also acts as a lasting record for friends and family as the patient’s condition worsens. Written life stories can include photos, mementoes, tickets, poems and quotes. You could also get grandchildren to help. As Alzheimer’s progresses, some of the symptoms can be particularly upsetting for friends, family and carers: you may witness the patient hallucinating, frequently falling, or struggling to speak. This takes a toll on caregivers and loved ones, too, as it becomes harder to keep someone safe and meet all their needs. Respite care is crucial; nobody can monitor someone 24/7. You need time to recharge your own batteries, mentally and physically. Carers’ Support groups up and down the UK will give you a sense of community and help you meet like-minded people at different stages of caring. Look out for memory cafes, which carers attend with their friends or family, and day centre sessions. You could also benefit from talking therapy, giving you an outlet for your emotions and worries. This therapy doesn’t have to end when your loved one goes into residential care or sadly passes away – the grieving process is long, and it’s different for everyone, so you may need more time to process your feelings and cope with loss. If you’ve given up work or perhaps moved house to support someone with Alzheimer’s, there will be an adjustment period to cope with as you decide what your next step will be.